These days, there are so many good gluten-free pastas that we have the ability to choose. Almost every major grocery store carries gluten-free pasta of one kind or another. But we have the choice of one or another, we always reach for Bionaturae. When Danny was still at Impromptu, and the entire menu was gluten-free, he always had gluten-free pasta in the back for customers who came in. He only allowed this Bionaturae gluten-free pasta in his restaurant. It tastes good. It holds up. And unlike some of the other gluten-free pasta, this one doesn’t fall apart or sag in the middle. It’s from Italy, where they know how to make pasta, for gosh sakes. Why would you trust anyone else? Buy some. You won’t be disappointed. I grabbed this when it was on sale at Whole Foods. It was great, although I did find I had to cook it a little longer than the instructions indicated. I used it in Pioneer Woman's fancy macaroni. It heated up beautifully, and stood up to both microwave and oven reheatings. ah, i'd eaten the pasta at impromptu and always wondered how it was so much less, well gooey than any other GF pasta i'd had. now i know! How would you say it compares to Ancient Harvest Quinoa Corn blend? That and Rustichella d'Abruzzo corn pasta are my staples. I have not found any rice based pastas that hold up as well and cook al dente with no mush, goo or aftertaste. I am always on the lookout for REAL gluten free pasta. Isn't it the best? Great flavor, the texture is great even reheated (provided you cook it slightly al dente to begin with) and everyone loves it, even my gluten-eating partner. Plus, it's readily available in almost all my local grocery stores, not just Whole Foods. Oh, nevermind. It contains soy which 2 people in my family cannot eat. Anyone seen it for sale in Canada? We are in love with Rizopia, but this one looks test worthy! They do sell it in Canada. I cannot eat rice or corn either. Do you recommend any pasta that does not have those ingredients either? this really is the best! i love the buttery flavor of the pasta. other GF pastas are gross to me unless they are covered in sauce, but this brand is great even on its own! And even better? The peeps behind the brand are awesome, fabulous people. Keep an eye out for their new Jovial Brown Rice Pastas. I think they're just hitting Whole Foods now. This really is the best pasta substitute I have found so far. I've eaten several that are just mushy and fall apart, actually ever since I found this one, I stopped looking for new ones. Yuck. And brown rice pasta = mush. DeBole's gf amaranth/quinoa pasta = major mush. I've switched to one that holds shape, and does not contain any other severe allergens like soy, corn, and nightshades. Explore Asian's Organic Mung Bean Fettuchini or Organic Black Bean Spaghetti. The Secret to good gluten free pasta is in the cooking. You may have a favourite brand but unlike regular pasta, if you overcook the pasta, then it will be mush or tasteless. Here's how: make sure the water is boiling before you put the pasta in. I mean fiercely boiling. Have some coconut oil or olive oil in there too. Dump in the pasta and quickly stir for 10 seconds. Then do not keep stirring. Time 8 mins exactly. At this point taste test it but usually it's bang on. Don't stir too often either if you don't like pasta porridge. For more gluten free and wheat free recipes plus how to cope when eating out or travelling abroad let me know – I'd be happy to help. Love this pasta – I even call ahead and usually restaurants will make it for me! My daughter's favorite meal is pasta. When she went on a GF diet, we tried hard to find a good pasta for her. We discovered Bionaturae and she never tried another. If it weren't so expensive at our local grocery store (6.98/lb.) I'd serve it to the whole family! I was desperate for a good GF pasta — something that tasted just like "regular" pasta, and this one hit the mark perfectly. I was hesitant to taste it (afraid I would be disappointed), but my hesitation was unwarranted. This pasta is AWESOME! I also reheated it for lunch the next day, in the microwave oven, thinking that it wouldn't hold up to reheating the next day, and WOW, it reheated perfectly, and tasted just as wonderful the next day. This pasta is heaven sent! 🙂 Even my picky 10-year-old loved it! After eating it for dinner last night, she said, "Mom, we can eat real pasta again!!" We recently traveled to Italy and there were several brands that we loved. Another favorite was "Schar" brand pasta and some of their bread was great for toast. If you are looking for crackers, then "Zero Grano" had some that tasted like saltines. If you get a chance to travel Italy GF, it was amazing how helpful they were! Where can you buy in the Seattle area? I dropped by the Roosevelt Whole Foods today and although they carry Bionaturae, it was only their wheat/semolina products. Couldn't find gluten free. GF for 10 years and Bionaturae is the best pasta I have had to date. Best bread to date? Udi's Whole Grain bread – you don't even have to toast it!!! I made this pasta tonight, and it was a big fail! I think I over stirred it because the package says frequently stir to avoid sticking together, which I hate with gluten free pasta. Added a teaspoon of olive oil, while the pasta was boiling to give it some luubrication. So frustrated with another pasta fail, I think I might try a penne pasta, where it won’t be so easy for the pieces to stick together and make a giant nooodle. Read some previous posts on here and will utilize the tips from them on my next attempt. These noodles are the best that I’ve tried too! I even made tuna salad with them with the egg noodles and no one could tell the difference. Turned out awesome! 3 family members with celiac. Tested many rice and corn based pastas. 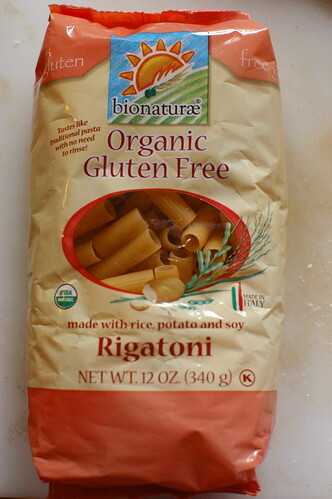 Bionaturae is by far the closest thing to real pasta. Almost cannot tell the difference except for the price. This is the only GF pasta you need to buy. They have it in linguine, spaghetti, and penne too which is great.